If one were to simplify this, the common themes associated with beauty seem to be perfection, harmony, pleasure, inner meaning and satisfaction. Perfection and harmony are attributes of the object of beauty whereas pleasure, meaning and satisfaction are the experiences of the beholder. So if one were to define beauty in terms of former, there remains little scope for any subjectivity. All one has to do is to put a measure for perfection and harmony and set up an instrument for measuring the same. And presto! A machine can define beauty for you. So there is no question of real beauty meaning anything to a specific individual. Real beauty is the same for you, me and every one of this earth. So if we have to talk in terms of real beauty’s meaning to an individual, it has to be in the later domain – pleasure, inner meaning and satisfaction. So real beauty to me is what gives me maximum pleasure, inner meaning and satisfaction. So how do I compare experiences and compare degrees of pleasure, meaning and satisfaction and come up with which experience gave me the maximum level? When I think about it, it is not that difficult. At its maximum, I do not even perceive them. I become one with the experience, no longer thinking about the pleasure, meaning and satisfaction. When the experience ends, it is as if I have woken up from a dream. Anything that evokes this kind of experience in me is what I call real beauty. It is not without reason that poets from times immemorial have extolled the beauties of nature. Nature has worked over eons to achieve perfection and harmony and is still striving. A mountain’s loftiness, a sea’s relentlessness, a desert’s vastness! The serenity of dawn and the calmness of dusk! The hues of the sky and the sea, the flowers and the leaves and the colorful rainbow! The first morning cry of wild birds, their evening chirping and the late night wolf’s howl to the moon. One can just loose oneself in these myriad wonders of nature. Mother Nature just holds you spell bound in her charm and you are one with her. That’s real beauty – pure unadulterated beauty! “In deep meditation the flow of concentration is continuous like the flow of oil”, says Patanjali in his ‘Yoga Sutras’. This concentration that Patanjali is talking about is a wonderful feeling and I have experienced that when I am doing something I love doing and get deeply engrossed in the work. The striving to create perfection that makes you one with your work and partake of its perfection is true beauty. I get the same feeling when experiencing works of perfection created by others. When I read a book, listen to music or look at a painting, the perfection the artist has tried to effuse into his works draws me in its grasp and I forget myself in their charm. That’s real beauty - the beauty of creating and the beauty of creation! Any discussion on beauty would be incomplete without touching on the aspect of love. Beauty induces a feeling of love and love creates beauty. But it is not just love that has beauty in it, the entire gamut of human emotions have beauty associated with them. Each of the ‘Nava Rasas’, the nine emotions – Love, mirth, sorrow, anger, enthusiasm, terror, disgust, astonishment and peace have beauty associated with it. Of course going by the definition, one can argue that only the positive emotions invoke pleasure and so negative emotions cannot be called as beautiful. But if that were the case, how would one account for man’s fascination for tragedy, revenge and horror? From times immemorial, well made stories, plays and movies having these themes have enjoyed as much success as those depicting love, mirth, enthusiasm. To me each and every raw human emotion in its purest form is beauty. Beauty is often considered a thing of the heart and people often demarcate between art and science. The former is supposed to be the domain of the heart and the later that of the head. But are the head and the heart unrelated? When I read Michio Kaku’s book on string theory or Jared Diamond’s work on human civilization, I get the same feeling when that I get looking at the sea during sunset or gazing at paintings of Van Gogh. I used to get the same joy when I solved complex physics problems from a book by one Russian gentleman named I E Irodov when I was in school. I would definitely say science has as much claim on beauty as art. There is no greater testimony to this than the story of Archimedes running out of his tub naked shouting ‘Eureka, Eureka’ in the excitement of his discovery. If something that evokes this kind of emotion is not beautiful, then what is? I seem to have been running all over the place in an effort to cover maximum ground. It might have given an impression that I consider beauty as a combination of loosely hanging threads of disparate concepts. Nothing could be further from the truth. In fact all these facets are deeply intertwined. Nature or deep personal emotion is what inspires man to create his masterpieces. These masterpieces in turn create deep emotion. That’s beauty. And if one were to think of science, isn’t it just another way of appreciating the beauties of nature. Art I would say is an intuitive admiration of nature whereas science is a analytical admiration. Each of these aspects could have been covered in depth. But in order to have breadth, I had to sacrifice depth. If one has to cover the topic of beauty in its entirety of breadth and depth, all the books in the world would not be sufficient. Poets and philosophers having been attempting the task from ages and still I believe the breadth and depth have not been fully fathomed. As I conclude, I just wanted to briefly touch the topic of physical beauty and use of cosmetics, clothing, ornaments etc. After all that is what comes to mind first when beauty is mentioned, doesn't it? Whereas models and actresses deck themselves to glory, the general feeling among the intelligentsia seems to be that beauty is just shallow and not real beauty. Though there is some truth to that, I would not fully agree. There is often this unfair association between vanity and trying to look beautiful. I would say trying to look beautiful is not just for your own self but for others as well. I myself used to consider looking good a crime and used to roam the city with my hair uncombed in a torn shirt, a faded pair of shorts and an old battered Hawaii slippers. But then I happened to read this book ‘What Katy did.' Then I realized you are making others happy by looking good and you are insulting the people you are hanging out with by looking like a ruffian. From then on I gave myself over to the hands of my mother and later my wife and to procure whatever manner of attire that captured their fancy and wore them without protests against their attempts to dandify me; when I was ordered to shave or comb my hair, I obeyed docilely. Human beauty is after all an aspect of nature. And as far as conscious attempts to make one self look beautiful goes, couldn’t the people doing that also be considered as artists who use their bodies as the canvas to express perfection. 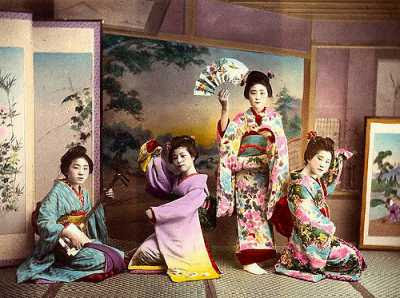 Geishas represent the pinnacle in this art of expressing perfection through one’s own body. And people definitely find it pleasurable to see aesthetically appealing facial features, male bodies with six pack abs and size zero female bodies. Else why would they be so excited about the film stars and models? So that aspect of beauty can definitely not be discounted, though that by no means is the only form of beauty. Thanks Asha. That is true. But I was thinking from my point of view where I considered looking even remotely good as vanity and went out of the way to look shabby and resisted any attempts by mom to make me look presentable. And yes. I too was talking about this flow state. Though I did not know who had first discovered this idea. Thanks for sharing the article.